The seventh film by Quentin Tarantino, Django Unchained is a lurid blend of seventies exploitation cinema and Spaghetti Western. It’s also an intelligent, nuanced film about myth, violence, and friendship. 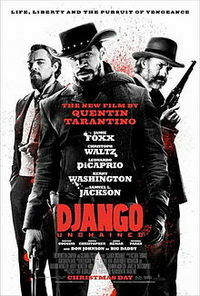 Bounty-hunter Dr King Schultz (Christoph Waltz) buys the freedom of Django (Jamie Foxx) in exchange for his assistance in tracking down the outlaw Brittle Brothers. As a free man and bounty-hunter, Django sets out to free his wife, Broomhilda (Kerry Washington). Thrilled to have discovered “a real life Siegfried”, Schultz agrees to assist Django in liberating his wife from the incongruously named Candie Land, home to amateur phrenologist and plantation owner Calvin Candie (Leonardo DiCaprio). It will come as no surprise to those familiar with “films by Quentin Tarantino” that Django Unchained is an assured blend of genres. What may come as a surprise is that one of these genres is a fairy-tale. Seeing the film as fairy-tale (or perhaps more suitably, as Romance) brings to the fore its fantastical nature. In particular, the Romance elements combine effectively with the mythic aspects already present in the Western genre. The landscape work is truly spectacular, evoking a sense of scale and impossible geography worthy of Sergio Leone. In addition, Tarantino takes already caricatured Western stereotypes and stock characters and exaggerates them even further, granting an almost folkloric quality to many of the denizens of Tarantino’s mythic South. This emphasis on the fairy-tale is not without its problems. In making Django the questing knight, the script reduces the character of Broomhilda to little more than the goal of that quest: the archetypal damsel in distress. She remains a haunting presence in the film, but ultimately lacks the power of Inglourious’s Shosanna. Seeing the film as fairy-tale also risks ignoring its engagement with a brutal and troubling period of history. Nevertheless, Tarantino negotiates well between the spectacular, pleasurably excessive violence of bounty hunting and the brutality of slavery, proving that the director is far more proficient at directing movie violence than he is at talking about it. The film is about more than slavery, violence, and vengeance however. The central pairing of Django and Schultz drives the film, more so than the relationship between Django and Broomhilda. Indeed, the film is very much about male camaraderie, which is perhaps to be expected of a film that is both a Western and a Tarantino film. The paternalistic relationship between Schultz and Django is not only genre appropriate (the old hand training the greenhorn), but genuinely touching. The positioning of Schultz in patriarchal relation to Django does cause some uneasiness, however, and the forthcoming Alternate Take will explore this issue. Waltz is superb in an academy-nominated supporting role. Schultz has some great dialogue, and Waltz’s delivery is cultured and laconic, giving the character a wry, world-weary air. Sporting a magnificent beard and flamboyant mannerisms he is nonetheless able to bring real feeling to a role that, in less skilled hands, could have been simplistic eccentric. Foxx’s performance is quieter and more reserved for much of the film. Django may lack the steely-coldness of Eastwood’s Man with No Name, but he is a more easily sympathetic, rounded character and Foxx’s performance reflects this. Foxx may be overlooked in favour of some of the flashier performances (Waltz, a petulant and terrifying DiCaprio) but he anchors the film. Importantly, he is also impeccably cool. Whilst long, the film is well paced for the most part, complemented by a great soundtrack. At once mythic and personal, Django Unchained is an immensely satisfying Western rooted in strong performances, and a worthy addition to the Tarantino stable. This review was published on February 05, 2013.